Hip Girl Boutique is a company which is founded in the year 2005 and which is making ribbons, hair bows, DIY bows, hair bow hardware, hair flowers, bow cards and bags for craft show, as well as offers free hair bow instructions. These HipGirl hair cutting and hair thinning shears are made of stainless steel which is known as durable and long-lasting material, therefore, these hair scissors have the same qualities as well, namely, they are designed for high performance and longevity. Hair cutting shears have razor edge convex hollow ground blades for superior edge retention and cutting quality, but hair thinning scissors have 22 razor-sharp micro-teeth on one blade and razor edge on other blade, providing perfect cuts for long time. Both of these barber shears are 5.5. inches long. These hairdressing shears have knob for tension adjustment which is very important quality for professional hairdressers. Both of them have finger rest for better comfort which is removable if needed. None of them has rubber finger inserts which play the main role in adjustment of size, therefore, if your fingers are not appropriate for their finger holes, they may be uncomfortable to use. These cutting and thinning shears do not come with any storage case, therefore, if you need it, you have to buy it separately. These HipGirl hair cutting and thinning shears have simple and traditional design, namely, they have no special design elements. Considering that they are made of stainless steel, they are silver color and have nice sheen because of polish. HipGirl’s cutting shears are made for hair cutting, but thinning scissors are intended for hair thinning or, in other words, for reducing of hair volume. With cutting scissors you can practice various hair cutting techniques, for example, slide, chip, point and blunt. Despite the simplicity of design and features, they are suitable not only for hairdressing students, but also for professional hairdressers. These HipGirl Cutting and Thinning Shears which come in set are made from stainless steel for durability and longevity. 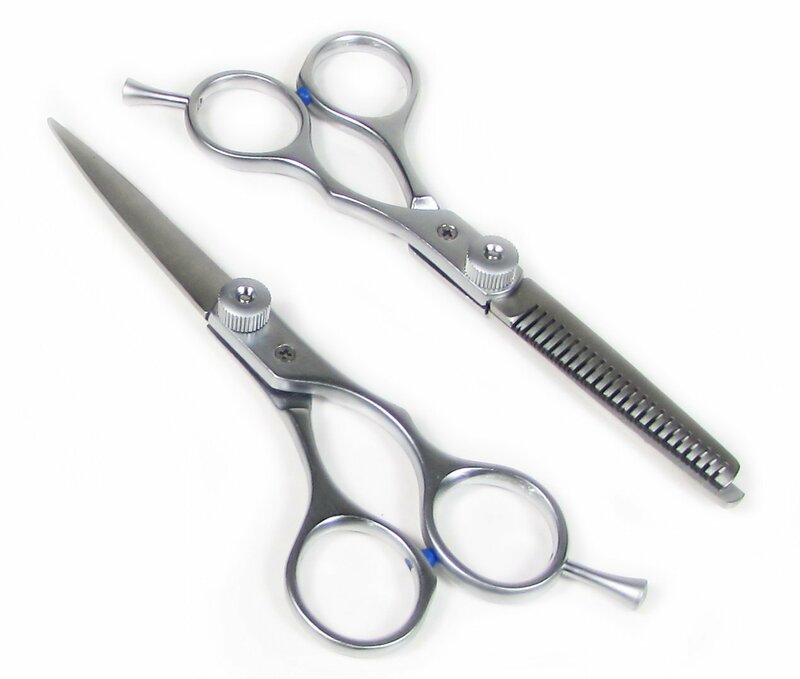 Hair cutting shears have razor edge convex hollow ground blades, but thinning scissors have one blade with micro-teeth edge and other blade with razor edge. It should be mentioned, that these hair thinning scissors have 22 razor-sharp micro-teeth which ensure perfect hair thinning. Both of these barber scissors are 5.5 inches long and are silver color with slight sheen. They have knob for adjustment of tension, as well as removable finger rest. Unfortunately, they do not have inserts for finger holes which are necessary for size adjustment. As mentioned before, both of these shears come in set, but this set does not include any storage case. These HipGirl hair cutting and hair thinning shears can be used both by professionals and students, because they are made as professional hairdressing shears, but they have affordable price as well.